Hiring? Toptal handpicks top business model consultants to suit your needs. Alex is a trained treasurer and CFA that has managed investments ranging from $3bn of bond assets, to $15m Latin American micro-VC funds. Prior to its golden era of the late 20th century, corporate strategy mainly focused on how to maintain monopolies. From the late 1970s, Michael Porter introduced a number of popular strategy frameworks, most notably his Five Forces Framework and Generic Strategies. The Generic Strategies state that competitive advantage can be achieved through either cost leadership, differentiation, or a focused mix of the two. 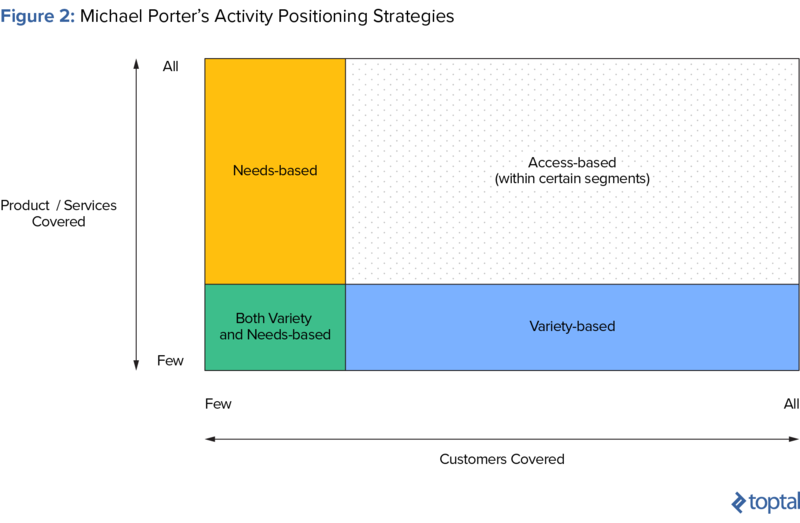 Through his activity positioning framework, Porter prescribed that firms can achieve competitive advantage through three positioning strategies: variety-based, needs-based and access-based. Variety-based: producing a subset of an entire industry's products or services. Segmenting through the choice of offering, not by customer. Needs-based: focusing on a certain segment of the industry's customers and aiming to fulfill all of their needs. Access-based: targeting customers with similar characteristics, but differing routes to access the product/service. Using tailored methods for serving them within the market. Despite being 24 years old, Nvidia's stock has grown 1,100% over the past four years. It also has year-on-year revenue growth of 48% and 58.8 gross margins. It has built a successful niche by focusing just on the graphic processing unit (GPU) segment of the chip market, where it holds around 80% of the market share. Nvidia's focused approach has allowed it to accelerate GPU innovation at a faster rate than the incumbent central processing unit (CPU) market and new industries like artificial intelligence and self-driving cars have formed around it. 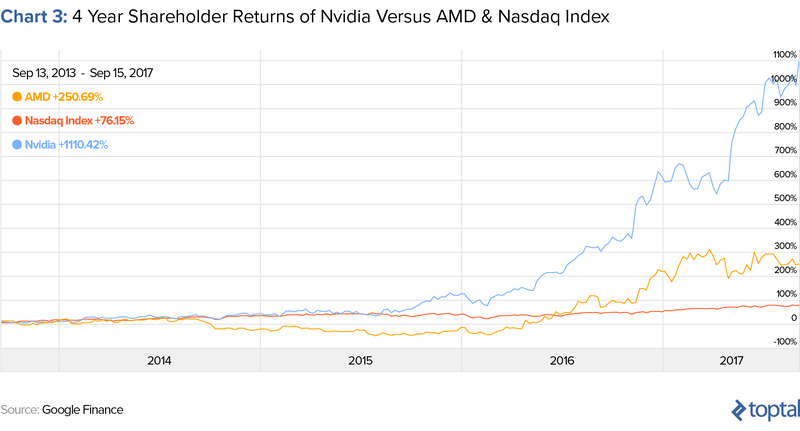 AMD, the main competitor of Nvidia, has underperformed comparatively, because its focus is more widespread, resulting in diluted efforts. Pinterest arrived into the social network market late, yet at seven years old it is the 10th highest valued private technology startup in the world at $12.3 billion. By focusing on certain segments of visual discovery, such as fashion and design, it has built a focused base of users with defined use-cases for the platform. 81% of users are female. Xoom succeeded in the remittance market because it realized that the needs of money senders are common, yet they have different ways of accessing services. Compared to incumbents, such as Western Union, it offered more options for sending and receiving money. PayPal eventually bought Xoom for $890 million in 2015. Despite being the king of electronic payments, PayPal needed Xoom for its expertise in access-based positioning. 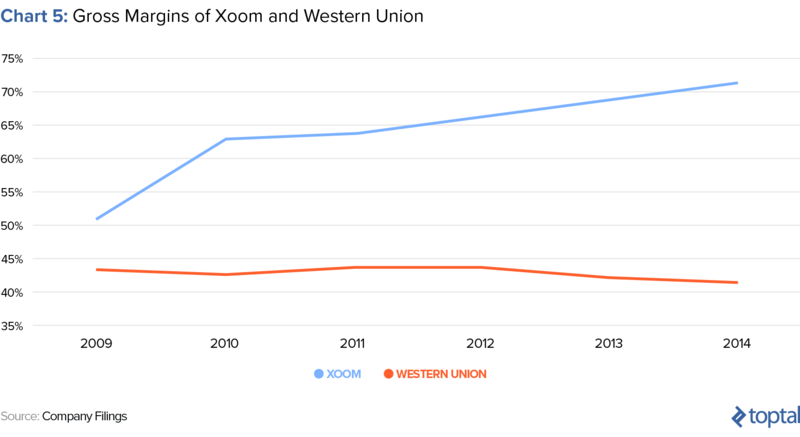 Xoom worked as a conduit, enabling payments, as opposed to PayPal (and indeed Western Union) which required users to be inside its ecosystem. Within the realms of the business world, pre-20th-century theories of competitive strategy focused on binary outcomes; mainly how to bludgeon markets with monopolies and exclusivity agreements. As markets became more liberated, compromises and specializations became more important and up to the mid-20th-century teachings moved towards gaining internal proficiency within business analysis. In the late 1970s, competitive business strategy was brought into the mainstream through the publication of Michael Porter’s Five Forces Framework. Offering a competitor analysis tool to assess markets based upon dynamics of the bargaining power of buyers and suppliers, the threat of new entrants and substitutes, and overall industry rivalry. A more in-depth explanation of this method can be read here. Porter’s Generic Strategies inspired countless case studies, recounting the successful types of competitive strategy implemented by businesses such as Walmart, Southwest Airlines and Ikea. In 1996, Porter wrote “What is Strategy,” which introduced his activity positioning strategies, describing paths that businesses can take in order to gain competitive advantage within value chains. He wrote that there are three activities that can be followed within this positioning framework, variety-based, needs-based, and access-based. As a compliment to the generic strategies, these tactics gave more clear paths towards how a firm can gain competitive advantage and thus, succeed within a wider generic strategy. For example a cost-leadership generic strategy merely implies that a firm must produce at the cheapest cost. But how does a company reach that point? Porter’s activity strategies complement this work through offering positioning routes. They are shown visually below, followed by their explanation with some competitive strategy examples from successful companies of the era. This is a strategy wherein a firm produces a subset of an entire industry’s products or services. It thus chooses to not segment itself by the customer, but instead through the choice of offering. This focused approach can allow a company to scale through specialization and, by allocating resources to specific areas that enables it to accelerate innovation, drive better service and achieve lower costs. The converse of variety-based positioning is the option of just targeting segments of customers and fulfilling all of their needs. This builds excellence through understanding a customer and capturing its full value-chain through tailored service and repeat business. The examples provided for this strategy were within the industry of wealth management. Whereby Bessemer Trust and Citibank had gained success by solely targeting clients with investible assets of $5 million and $250 thousand respectively. The final strategy is targeting customers that have similar needs, but with disparate access routes to the product or service. Access can be defined by customer geography or customer scale, insomuch that a firm requires different delivery methods in order to serve them effectively. Carmike Cinemas (sold in 2016 to AMC Theatres) was provided as an example of a successful application of this strategy. It was a chain of cinemas that targeted small town cinema-goers in rural areas. Operating a central corporate function allowed Carmike to gain economies of scale, yet it distributed the cinema experience through a tailored local service. One such example mentioned was via cinema managers who knew patrons by name and ran their own marketing campaigns. When we talk about strategy of digital companies, the conversation is usually framed around concepts of innovation, in particular towards Clayton Christensen’s Disruptive Innovation ideas. Yet once a a business has innovated, it still needs to have strategic planning in place to ensure that it can execute and seize competitive advantage. Apple and Nokia spring to mind for companies that have had their respective strategic successes and failures scrutinized heavily in recent times. In light of Porter’s competitive strategies being over 20 years old, this article will use his activity mapping framework to demonstrate the advantages of strategic planning via case study examples of success from the digital economy. Nvidia is a producer of graphic processing units (GPUs), which at the age of 24 is recording annual revenue growth of 48% and gross margins just shy of 60%. Impressive figures for a mature business. The GPU was invented by Nvidia in 1999 and, within the vast chip market, it is still the only offering that it produces. If you look on its website, instead of having the standard “Product” section listing its types of hardware, Nvidia shows the “Platforms” that it creates GPUs for. 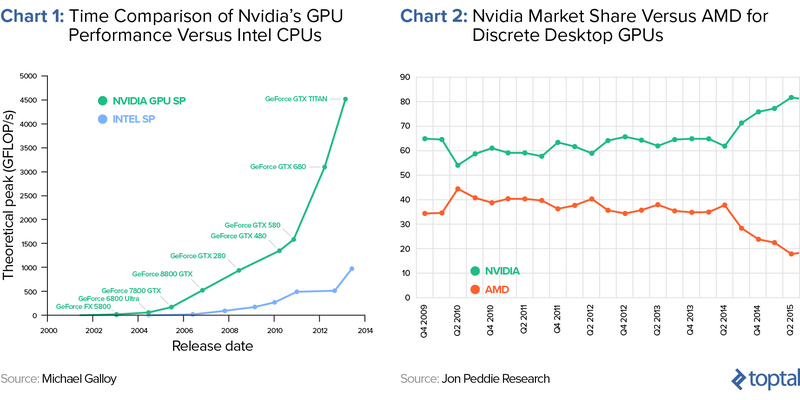 This is particularly pertinent as a successful application of needs-based positioning, as Nvidia’s strength in GPUs is so strong that it has tailored its SKUs exactly to the specifications of its client sets. The growth of video gaming has helped drive demand for GPUs and hence, the success of Nvidia. Half of its revenue comes from this sector. Such a specialization has not limited Nvidia; instead, as new industries have spawned, they have deviated towards the powerful technology that it creates. Self-driving cars and augmented reality are two such examples of new cases, which Nvidia has adapted towards and now serves. GPUs are now the center of the artificial intelligence universe, which will also be harnessed to help maintain the pace of innovation of GPU processor speed. The price of GPUs has risen in recent years due to cryptocurrency mining, which favors the most powerful GPUs. In June 2017, one analyst estimated that cryptocurrency mining alone drove $100 million worth of sales to Nvidia in just 11 days. One could call this a strike of luck, or a positive externality of its technology enabling new markets. As the pioneer of the GPU, Nvidia has built itself into a gatekeeper of the ecosystem, using events like the GPU Technology Conference to bring together stakeholders and keep itself at the center of proceedings. With a 58.8% gross margin, Nvidia outperforms AMD (23.4%) by almost 35%, which is a negative EBITDA business. AMD has been riding the GPU wave too and has comparable output performance from its chips. So why does it have poorer financial performance? Well, AMD is not as focused as Nvidia—it also makes CPUs, where it competes heavily with Intel. It engaged in an ugly, drawn-out lawsuit with Intel over antitrust matters that distracted it during the past decade, in addition to fighting with Nvidia in the high-end GPU market. AMD is overstretched and, hence, earnings have disappointed. The golden era of the social network pioneers may be long gone. Despite their continued popularity, Facebook, Twitter, and LinkedIn all emerged over a decade ago. The costs needed to build up a network and attract users are exorbitant and even if they aren’t winner-takes-all markets, it would take a brave business to try. Attention now has diverted towards messaging and interaction. The dominance of Facebook is demonstrated through its purchases of two of the most promising startups that recently emerged from this sector, Instagram and WhatsApp. One such company that has recently carved out a successful niche within this market is Pinterest. At seven years old, it is still relatively young and largely flies under the radar, yet it is valued at $12.3 billion (the 10th highest valued private tech company). Its network has 200 million monthly active users, half of whom are in the USA and 81% of whom are female. It grew its initial user base through referral tactics, shunning expensive paid-for acquisition methods. 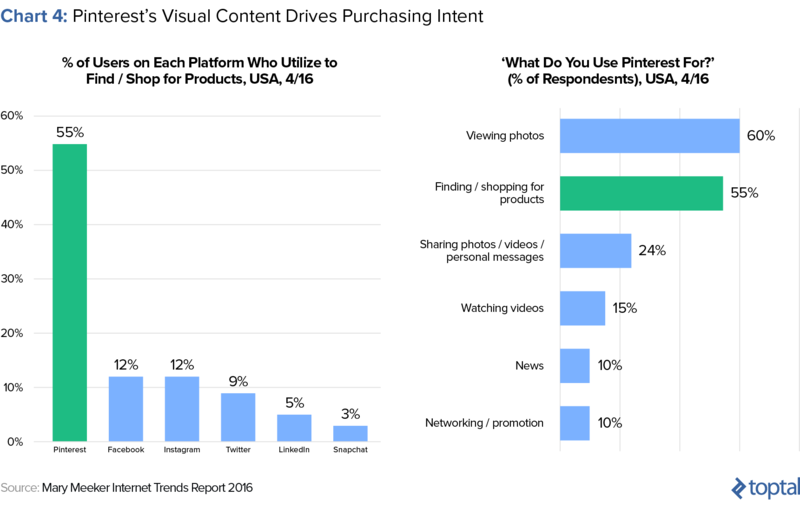 Its photo-based list interface has allowed Pinterest to naturally deviate toward activities that benefit from this, such as sharing interior design and fashion ideas. The user benefits because unlike, say, Amazon’s “Recommended for You” section, these lists are curated by users and bring wider and less biased suggestions. Having defined psychographics of loyal users and use cases for the network is catnip for marketers. Pinterest could have tried to compete with the wider social networks by being a “jack of all trades, master of none” type. Instead it embraced its core user base and those that drive the most value from image-based lists. This brand strategy has in turn also driven value for the other side of its market, advertisers. Despite only starting to record revenue from 2015, Pinterest made $100 million in that year, which grew to $300 million in 2016 and could reach $600 million by 2017. SharesPost International estimates that yearly revenue will continue to expand at 40-45% per year up to 2020. Through needs-based positioning, Pinterest has created a lucrative network that services specific users and through that it has found revenue opportunities via referral advertising. I feel that the best example of digital companies that have used effective access-based positioning to build competitive advantages are those in the money transfer industry. Looking at remittances, the traditional process is that senders go to a branded bureau (for example Western Union) and then their recipient picks it up from another bureau in the destination country. Sure, it works, but who benefits the most from this? Western Union of course, who keep users within its ecosystem, regardless of the compromises that users have to make to send or receive. By eschewing using its own infrastructure and acting as an enabler of transfers, Xoom (established in 2001) gave its customers more choice. Xoom would allow a sender to send via their phone and then the receiver could obtain cash in a number of ways, such as bank transfer, phone top-up, or cash pickup. By not defining cash pickup to “Xoom bureaus” and instead using third party brands, it increased the options available to customers. This was also lucrative for Xoom as, in the process, it also earned higher gross margins than Western Union, as it did not have to build out any of its own proprietary branch networks. Xoom shows a great example of building competitive advantage via access-based positioning. Its users have the same needs (send and receive money), but each has nuanced aspects of their needs based on their geography. Cash pickup for an urban recipient can be an easy option to take, but for a rural dweller, the comfort of receiving it via phone credit may far outweigh the inconvenience of a journey to an affiliate cash pickup location. PayPal eventually bought Xoom in July 2015 at a $890 million valuation, a 32% premium to its share price at the time. Considering that PayPal is a behemoth of money transfer, why would it not just replicate Xoom itself? Well their intentions will have been driven by buying Xoom’s brand value, but also in buying its expertise for earning competitive advantage via access-based positioning. PayPal’s own P2P payments system has shades of Western Union’s, in that for one user to send to another, they both need to have PayPal accounts. We are in an amazing era of innovation, with startups and businesses ripping up norms and bringing value to consumers through more choice and utility. However, one reason that many startups ultimately fail is because they follow a mentality of “If you build it, they will come.” This leads to situations where startups get outmaneuvered in their markets by not considering how they can win competitive advantage. There are now many competitive strategy techniques for analyzing industries and competitors. Within these, Michael Porter’s frameworks provide solid tools for businesses to use for planning their positioning in the market. Despite approaching their 40th birthday, they still hold firm for digital companies to look towards when making business models and compiling competitive intelligence. Michael Porter is an American academic and professor at Harvard Business School. He is renowned for his works on business competitive strategy and healthcare policy. What are the four competitive strategies? Michael Porter’s Generic Strategies prescribed four themes for gaining competitive advantage: cost leadership, differentiation, focused cost leadership and focused differentiation. What is a strategic competitive advantage? This is a characteristic that allows a company (or country) to outperform its competitors. Some examples could be access to natural resources, higher caliber labor, geographic location, access to technology, and/or high barriers to entry. What is a low cost business strategy? A low cost business strategy is an approach where a business seeks to claim competitive advantage by producing its product or service cheaper than its competitors. For commodity products, this is particularly invaluable, as consumers will naturally deviate to this offering. What is a hybrid business strategy? A hybrid business strategy is when a firm seeks to gain competitive advantage by employing different tactics via a mixture of cost leadership and differentiation strategies. This is possible for firms with significant resources and disparate markets, reducing their chance of becoming "stuck in the middle." Alex is a London-based CFA charterholder who has had a global career. He enjoys freelancing to keep abreast of industry trends and to reinforce his experience from venture capital, consulting and bond/currency trading. With a technical skill set and an engaging communicative touch, he is proficient in valuations and market analysis. His breadth of work has ranged from projects with the Bank of England to helping a jewelry entrepreneur fundraise.